Keep Out Of Reach Of Children. Danger: See Back Panel For Additional Precautionary Statements. Precautionary Statements: Hazards To Humans And Domestic Animals. Danger: Highly Corrosive. May Be Fatal If Swallowed. Do Not Take Internally. Causes Eye And Skin Damage. Irritating To Nose And Throat. Avoid Breathing Dust. Do Not Get Into Eyes, On Skin Or Clothing. Wear Rubber Gloves When Handling And Wash Thoroughly After Handling. First Aid: If In Eyes: Hold Eye Open And Rinse Slowly And Gently With Water For 15-20 Minutes. Remove Contact Lenses, If Present, After The First 5 Minutes, Then Continue Rinsing Eye. If On Skin Or Clothing: Take Off Contaminated Clothing, Rinse Skin Immediately With Plenty Of Water For 15-20 Minutes. If Inhaled: Move Person To Fresh Air. If Person Is Not Breathing, Call 911 Or An Ambulance, Then Give Artificial Respiration, Preferably Mouth-to-mouth If Possible. If Swallowed: Call Poison Control Center Or Doctor Immediately For Treatment Advice. Have Person Sip A Glass Of Water If Able To Swallow. Do Not Induce Vomiting Unless Told To Do So By A Poison Control Center Or Doctor. Do Not Give Anything By Mouth To An Unconscious Person. Call A Poison Control Center Or Doctor For Treatment Advice. Have The Product Container Or Label With You When Calling A Poison Control Center Or Doctor, Or Going For Treatment. 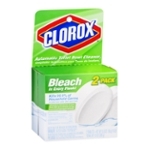 Clorox Information Line: 1-800-227-1860. Note To Physician: Probable Mucosal Damage May Contraindicate The Use Of Gastric Lavage. Physical And Chemical Hazards: Strong Oxidizing Agent, Keep Away From Heat Or Flame. Mix Only With Water.